This is a recipe I have actually made and eaten in a few different guises. 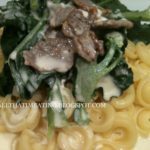 Once I added the same ingredients but made it into a macaroni cheese, another time I added similar ingredients and had a cold pasta salad. My creamy bacon, spinach and pea pasta is a real favourite in our house for two reasons: we almost always have all the ingredients, and it’s cheap and quick to make. I don’t know what it is about peas and pasta but I love the combination of silky, smooth pasta and squeaky peas. With so many things going on at the moment, the World Cup, Wimbledon about to start, this excellent weather and doing up the house anything that takes less than half an hour to make is my best friend. Add a little olive oil into a frying pan and add the bacon. Fry over a low heat until the fat starts to melt out of the bacon. While the bacon is frying bring a large pan of salted water up to the boil. Add the pasta and cook according to pack instructions. Turn the heat up on the bacon so it turns brown and crispy then add the peas and spinach. Leave to cook for 2-3 minutes and break the spinach down with a wooden spoon. Stir the crème fraîche into the pea mixture then bring to a gentle simmer. Drain the pasta reserving a small amount of cooking water. Add a little salt and plenty of pepper to the peas and bacon before mixing with the pasta and cooking water to make a smooth sauce. If you haven’t tried frozen spinach it is such a great ingredient. I chuck it in everything from sauces to soups and pestos. Fresh spinach would be delicious to use and if any arrives in the veg box I would definitely use that instead; just wilt it first, squeeze out the moisture and roughly chop before adding in. Salty, smoky bacon with sweet peas, earthy spinach, pasta and a sharp creamy sauce is such a great combination. I think I’ll try stirring this mixture, without the crème fraîche, through a risotto soon too. A great tasty pasta dish. Bacon and pea are a great combination and it is very easy to prepare. Everything tastes better with bacon :-)) That sauce looks really great! Dishes like this save us on a weekly basis! I love your measurements – seriously. They make everything so doable for first time cooks. A half a mug… a nugget… nothing exact but everyone gets the idea! 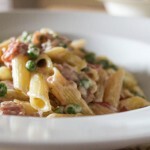 Bacon, cheese, peas, pasta – so perfect ad works for a great weeknight dinner! Thanks for th recipe! A great quick recipe for sure. Love this combo, especially with bacon. Peas and pasta really go well together, don’t they? We make something pretty similar sometime. Your version is terrific — thanks. 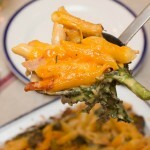 Really like the idea of using crème fraîche in your pasta dish, it makes it extra special. This Creamy Bacon, Spinach, and Pea Pasta look delicious. We can make it this dish easily at home. Thanks for the sharing.